Slamet volcano, a majestic stratovolcano in Central Java, is Java's second highest and one of its most active volcanoes. It contains a wide summit area with 4 craters. Its most recent eruption began in April 2009. In its latest report on 11 Sep, VSI mentions that 165 eruptions occurred on that day with ejection heights between 50-1500 m.
Strombolian activity from the vent inside the summit crater continues. A small ash plume was reported today by Darwin VAAC. Strombolian explosions are continuing from the new cone inside the summit crater. Some of them produce small ash plumes spotted on satellite imagery by VAAC Darwin who monitor the (volcanically very busy) region for volcanic ash plumes. Our correspondent Aris Yanto (Ndeso Adventures) climbed the volcano Tuesday and observed strombolian eruptions from a vent in the summit crater that ejected incandescent material to 100-150 m height. Ash emissions were observed again today, producing plumes rising a few 100 m above the volcano's summit. 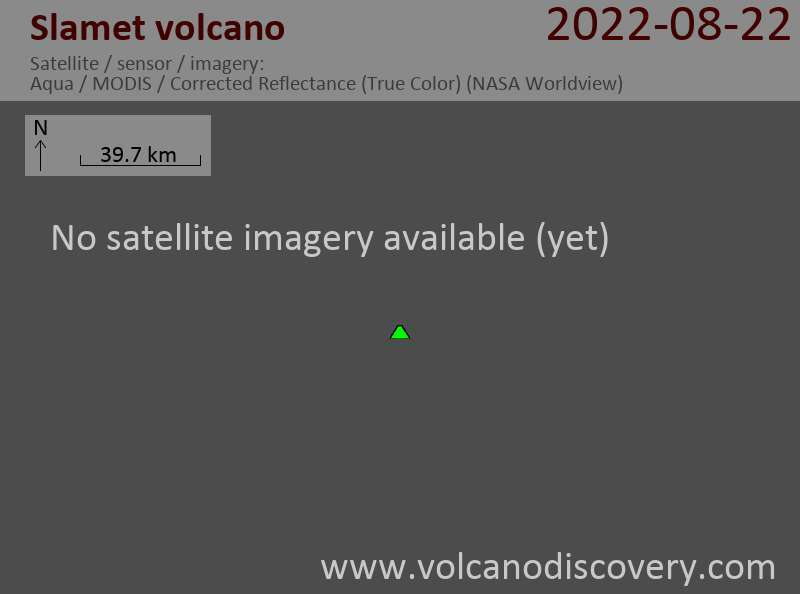 The strombolian activity in the summit crater is continuing, at least intermittently. 17 eruptions were observed during 1-2 July, compared to 14 during 15-30 June. Ash plumes have been rising up to 1,4 km above the crater and glow / incandescent material was occasionally observed. Following the increase in explosions, VSI raised the alert status of the volcano from Waspada to Siaga ("watch"), i.e. 3 on a scale of 1-4. Slamet is now along with Sinabung, Karangetang and Lokon-Empung the 4th Indonesian volcano on high alert. A particularly strong explosion this morning threw lava bombs to 1500 m distance during a stronger explosion this morning. Light ash fall occurred in areas to the NW. The explosion was the largest in the current eruptive episode so far. This activity came after a steep increase in volcanic earthquakes from averages of approx 50 to more than 200 per day, volcanologist Mr Sudrajat from the local observatory told the press. According to Aris on facebook, who climbed Mt Slamet on 4 Aug, this volcano erupted only from July 13 to July 18, and has been quiet again since. Strong degassing is visible from the summit crater. Es wasreported, dass am 8. August ein Aschewolke aus Slamet 90 m erhob sich über den Gipfel.